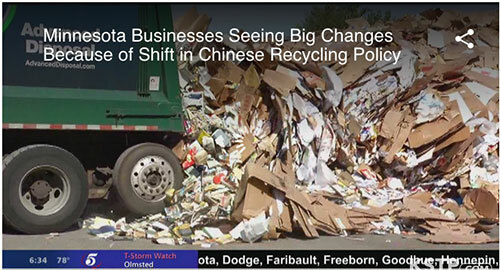 China is curtailing the amount of recycling material it accepts from the United States. This continues to be a pressing problem since the U.S. has shipped much of its recycled paper, plastic and glass to China for years. CIMA producer member Insolution of Minnesota was recently featured in a local news story about how they, along with other cellulose insulation producers, are helping to recycle the excess waste paper domestically. The change also can mean good news for consumers. Cellulose insulation contains over 80% recycled material with most of that in the form of post-consumer waste paper. More paper being recycled domestically increases the supply available for production. It starts with homeowners and businesses considering the Greenest of the Green cellulose insulation when choosing an insulation product for their homes and buildings.